The following is a post from the Real Farmers Real Food, a blog by Casey Whitaker of the Animal Agriculture Alliance. Being present on social media is more important than ever. You can influence and educate thousands of people in a matter of minutes with a simple photo or video. We love sharing content from our producer members’ Facebook pages onto the Federation’s Facebook page. If you have content you’d like us to share with our followers, please contact Kelly Pruitt at 804-290-1293 or kprui@vafb.com. We also have a closed Facebook group for Farm Bureau producer members. If you would like to be added, please contact Kelly Pruitt above. When Facebook debuted I was a freshman in high school and the social media platform was all any one could talk about at the lunch table. Everything revolved around the conversations being held on Facebook. I found it quite annoying and was hoping it was just a fad. I held off joining the Facebook brigade until I was a senior in high school – the only reason I signed up for an account is because my mom insisted I get one since I was moving away for college. Fast forward nine years and I manage social media for the Animal Agriculture Alliance. I won’t lie – I still find social media to be annoying some days, but it is such a powerful communication tool that I find it to be more fascinating. What’s amazing about social media is how many people one person is able to reach with one post – whether it’s with 140 characters, a graphic, video or blog post like I’m writing now. One person can potentially reach millions of people without leaving the comfort of their desk, couch or favorite coffee shop. This can give someone a megaphone to get their message heard who may not have a voice otherwise. In regards to agriculture, social media provides an outlet for producers, farmers and ranchers to share what they are most passionate about – providing a safe and affordable food supply for our great nation. By managing the day-to-day social media at the Alliance, one of my favorite things to see, and hope to see every time I post, is engagement from not only consumers who are curious about modern agriculture, but having our posts provide an outlet for farmers and producers to chime in and either answer questions or share what they do on their farm. From what I can see, consumers generally appreciate when their questions are answered by farmers and this helps build on the trust that most people already have in America’s food supply. Personally, my favorite platforms are Twitter and Snapchat. Some may argue that Snapchat isn’t a true social media platform, but it allows users to share a message like all the other platforms and I’d like to applaud them for one of their recent messages or “stories” as they are called. Snapchat is all about sharing quick photos or videos with your friends or followers. The trick is that the content disappears after just a few seconds. The platform sometimes features “stories” that combine posts from users at the same event, in the same place or with a theme in common. 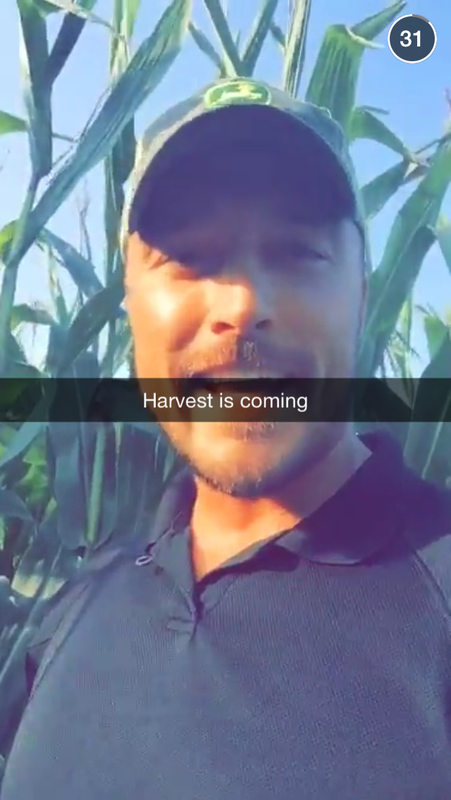 A week or so ago, Snapchat put out a story titled “Farm Life” and it was awesome to say the least. The stories included farmers from across the country sharing a few seconds of their day. My favorite was the video of the cow giving birth – why? Imagine how many people have actually seen a cow give birth – not many I’d argue, but thanks to Snapchat they were able to see it whether they wanted to or not. This story allowed people removed from agriculture to see just a few things that American farmers do every day to keep food on our plates. In case you missed the snaps, I’ve included some screenshots throughout this blog post. The farmer from the last season of The Bachelor even made an appearance! The only part I didn’t like was when it all disappeared, but hey that’s Snapchat for you, right? More than just a post, tweet…or snap! If you’re not active on social media because you find it annoying or don’t want to listen to people complain, I understand (really I do), but there is so much more to Facebook, Twitter, Instagram and even Snapchat than just a post. Social media gives everyone a voice, but also an avenue to connect with people and ideas that he/she may not be introduced to otherwise. It is important that the agriculture community is one of the voices being heard. We all know that the opposite side has a big voice and is more than happy to share their version of agriculture’s story so we need to be out there reaching the consumers and media that want a truthful, factual answer about where their food comes from and how it’s produced. There are organizations, such as Farm Bureaus, checkoff organizations and even the Alliance that work to spread factual information and engage with the media and consumer groups about agriculture, but hearing from the individual farm families that are on the farm every day is what leaves a lasting impression on the public in my opinion. If you’re just starting out on social media and could use a few pointers or would like to strategize on how you can be the best advocate, reference the Alliance’s social media guide which outlines all the major platforms and what types of messages are ideal for each. Oh and Snapchat, feel free to do more “farm life” snaps!